Panasonic HDC-SD60 is one of the lightweight and compact AVCHD camcorders for 400 to 500 bucks. The SD60 camcorder records superb video images, and manages in poor light for footage. Adobe Premiere Pro CS4 is supposed to support AVCHD import, but it does not work very well. While playing in the preview window of Adobe Premiere, some frames are replaced by the same frame, or it drops a few frames and has some small glitches during playback. To get rid of the issues above and enjoy smooth playback and editing in Adobe Premiere Pro CS4 on Mac, it is recommended that you use Aunsoft MTS/M2TS Converter for Mac to convert Panasonic SD60 1080i MTS to HD MPEG-2 for editing in Adobe Premiere. 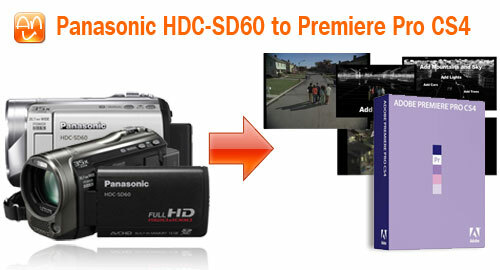 Here is the step-by-step guide for you to make the best of the HD videos from Panasonic HDC-SD60. 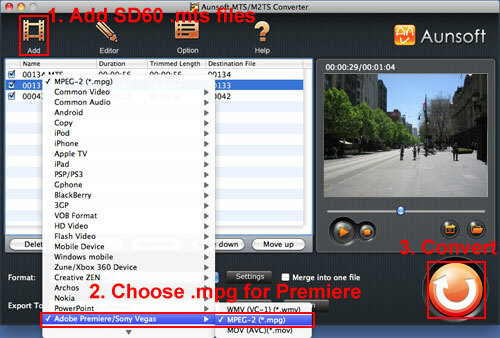 After copying .mts files from Panasonic SD60 to Apple hard drive, run Aunsoft MTS/M2TS Converter for Mac as the perfect partner for Panasonic HDC-SD60, and click the "Add" button to load .mts videos. Click the "Format" option, and navigate the mouse cursor to Adobe Premiere/Sony Vegas > MOV (AVC)(*.mov) as output format. The Mac Panasonic AVCHD converter will transcode HDC-SD60 1080i MTS to MPG with MPEG-2 as video codec for Adobe Premiere Pro on Mac Snow Leopard. Step 3. Convert Panasonic SD60 MTS to MPG for Adobe Premiere. Click the convert button under the preview window, the conversion from Panasonic AVCHD to Adobe Premiere Pro MPG will start right away. The output video will be kept with the original video resolution in 1920x1080. Wait for a while until the conversion is finished, and then you can put the output HD videos to Adobe Premiere Pro CS4 for editing, and create your own movies. How to Merge/Combine MTS/M2TS Files into Only One?